Adult Class instruction is Hapkido. Hapkido is a unique style of self-defense that emphasizes circular motion, redirection of forces, and control of the attacker. Kid class instruction is Tang Soo Do. Tang Soo Do, "The Way of the empty Hand”, is a hard style of self-defense with emphasis on kicks, punches, and self-defense techniques better suited for children and even adults. What will my child learn in Tang Soo Do? Beginning Class: Discipline, respect, rmproved listening skills, focus, flexibility, balance and coordination. Basic stances, punches, kicks, and basic forms. Intermediate Class: A continued improvement of all basic skills learned prior. Introductions to sparring using hands and kicks, combination movements, forms, and basic self-defense. Advanced Class: Improvement of all skills learned prior. Falls and rolls, advanced sparring, combinations using punches and kicks, advanced kicks, advanced forms, and advanced self-defense. Our age range is 7 — Adult. Hapkido is a unique form of self-defense that uses various kicks, punches, joint locks, throwing techniques and grappling techniques. Hapkido emphasizes circular motion, redirection of force, and control of the attacker. Student will be taught proper footwork, and body positioning to gain leverage, and avoid the use of strength against strength with an opposing attacker. 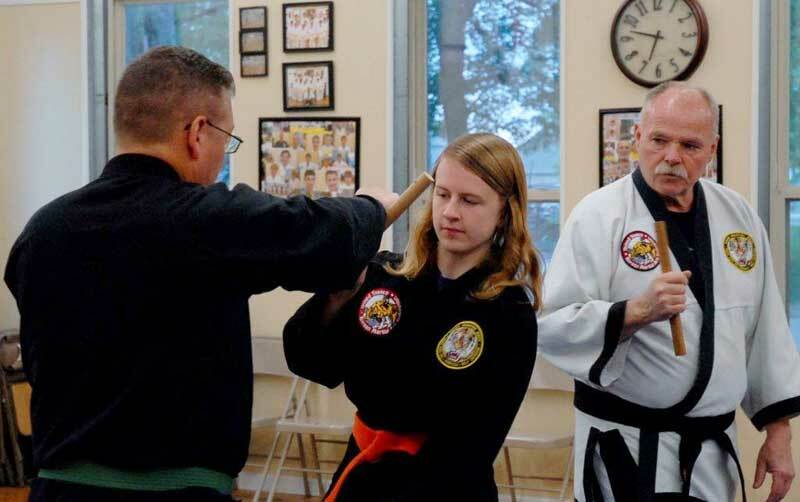 Hapkido is ideal for women, teens, and even the elderly. Basic levels are taught proper footwork, kicks, punches, hand strikes, pressure points, and joint manipulation. 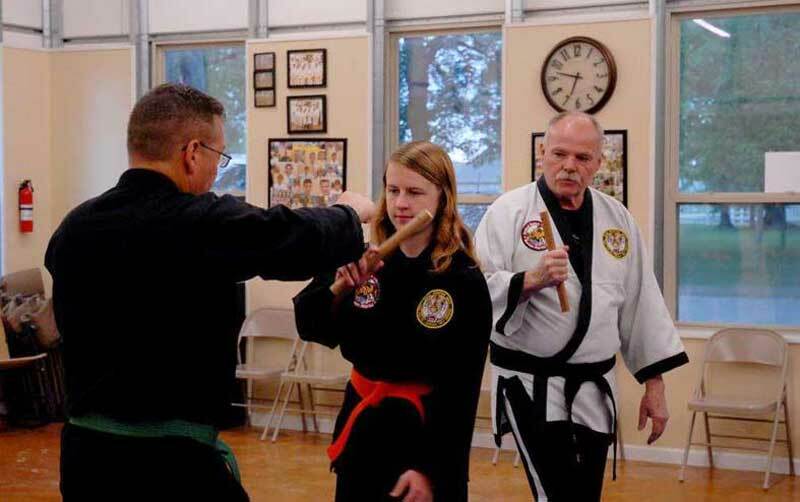 Adults are taught the how to use weapons such as a knife, sword, rope, short stick, and canes for self-defense. As students continue in the program, their knowledge will expand upon the basics with additional skills, and more elaborate self defense tactics.